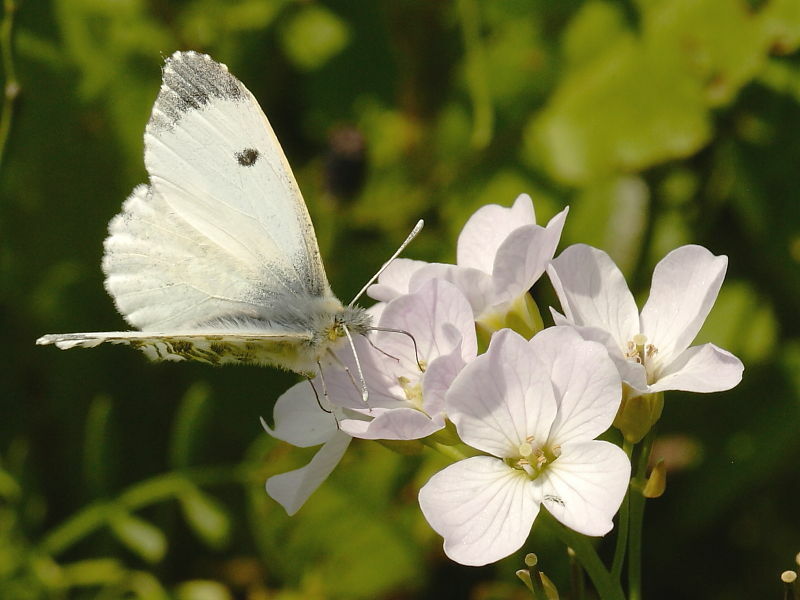 The Orange-tip Butterfly is found throughout much of Europe and the British Isles, although less common in the far north. In the UK it’s one of the earliest butterflies to emerge from overwintering as a chrysalis and can often be seen in small numbers both in gardens and open countryside. The butterflies are commonly seen on road side verges and flying along the hedges of country lanes. The larval food plants include Lady’s Smock, Honesty, Garlic Mustard and species of cruciferous vegetables. Both males and females have a wingspan of c 40mm. The male Orange-tip is easily identified by the striking orange patches and black edged tips to the upper side of its forewing. The female lacks the orange and may be mistaken for one of the ‘white’ butterflies, particularly when in flight. 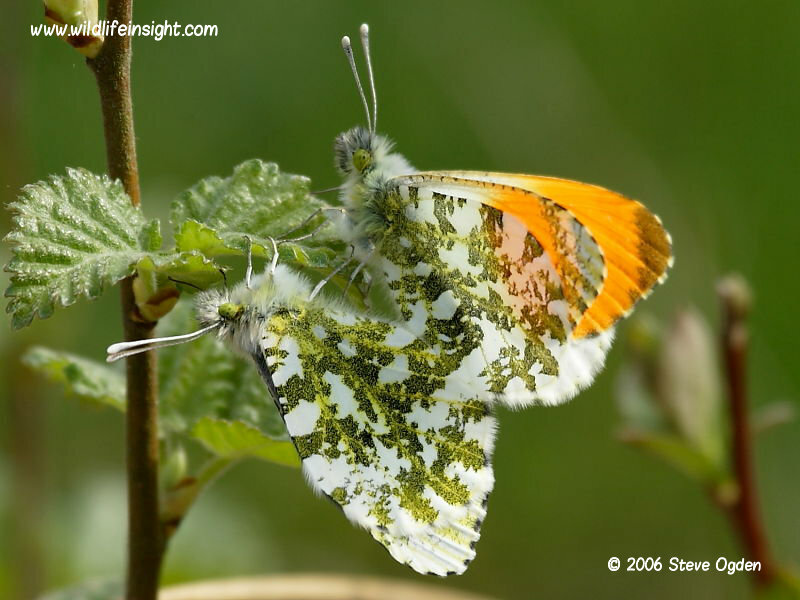 When seen at rest, with wings closed, both male and female Orange-tip butterflies can be identified from other ‘white butterflies’ by the rich green marbling on the underside of the underwings. The orange tips of the male’s forewings can also be seen from the underside. On the upperside of the females forewing the black spot is closer to the leading front edge than similar markings on other ‘white’ species. The fine veining is also not as pronounced as those of the Green-veined White Butterfly. Other commonly seen garden butterflies are The Peacock Butterfly, The Red Admiral Butterfly, The Comma Butterfly, The Small Tortoiseshell Butterfly and Painted Lady Butterfly. The Orange-tip is single brooded but with an occasional, smaller, second generation in the south. The earliest butterflies emerge in March with the main flight period between late April and mid June. Single eggs are laid on the larval food plants, often just beneath the flower heads. The eggs are pale at first but within a few days turn a conspicuous orange. The eggs hatch in about ten days when the emerging pale/orange caterpillar eats the shell. The small black bristles of early instar caterpillars have a tiny drop of fluid at the tip – perhaps, making them distasteful to predators. Later instars become greener and about 30 mm long when fully grown after 28 days. 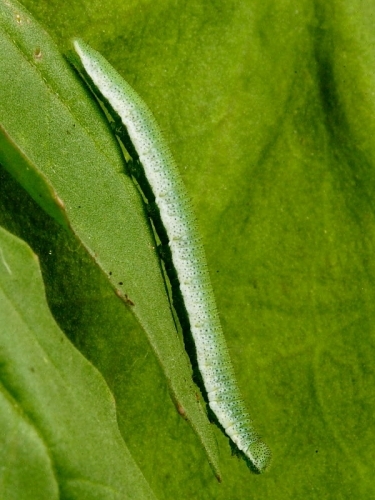 When larger the caterpillars are cannibalistic and so, unless food is plentiful, it’s unusual to find more than one fully grown caterpillar on a single plant. The pupating Orange-tip caterpillar is secured to a stem of nearby vegetation by tail hooks in a silk pad and a silken girdle. The cryptic, curved chrysalis can be either brown of pale green. The butterfly overwinters as a chrysalis, emerging the following Spring. Photographs features are of butterflies sighted in the south west of the UK and of caterpillars reared from eggs laid by a female in a Cornish garden. Pocket Guide to the Butterflies of Great Britain and Ireland – Richard Lewington. The Complete Guide to British butterflies – Margaret Brooks and Charles Knight. Collins Butterfly Guide of Britain and Europe – Tolman and Lewington. Copyright © 2010-2019 Wildlife Insight. All Rights Reserved. Click on any thumbnail image in a post or page to enlarge it.